De Cocoa Pañyol Blogspot: Doh stop de mas.....de palancin' continues!!! Playing mas in Toronto is a pretty sweet deal!!! 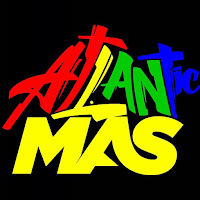 We are very lucky.......playing mas here not only affords you the joy of CARIBANA but you also get to play mas for HAMILTON CARNIVAL and BARRIE CARIBFEST. And if you're a Carnival Nationz masquerader like myself then you can use your costume at Miami Carnival too. Where else in the world could you use your costume up to FOUR times......seems like a pretty sweet deal to me!!! But wait maybe your band is actually taking part in Brampton's West-Fete.....that's this weekend too!! But then again maybe you're going way way out west to Alberta. The folks out in Edmonton will also be parading for CARIWEST. Wherever you are.......enjoy the festivities and soak up the culture.